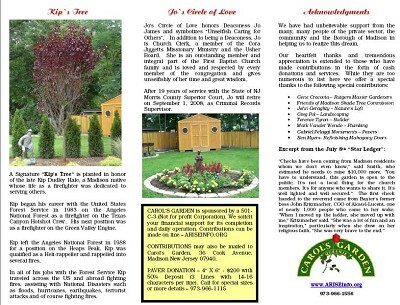 On Saturday, August 30, 2008, Carol's Garden officially opened to the public with a ceremony at 2:00 PM. About 150 people attended the ceremony which began outside the Garden gate with spoken words by Jo James Kelly Sallie for Carol's Living Fountain of Service; Keva Holman for Kip Hale's Tree of Protection; and Dionne James for Jo's Circle of Love. Mr. & Mrs. Willie A. Sallie, Carol's parents, cut the ribbon and our guests entered into the Garden while the song "In the Garden" played in the background. The Mustard Seed: After Caroline Smith did a reading about the mustard seed, the FBC youth distributed packets of mustard seeds to the guests. 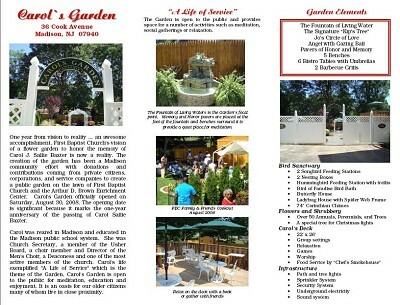 A Walk in the Garden: Fred Baxter, Carol's widower, read a beautiful piece he'd written for Carol and following this very emotional period strolled into the Garden where he took a seat in front of the fountain. Coins of Memory: Carol's family and friends were invited to toss coins into the fountain. The Pavers: Robert James dedicated the pavers donated "In Honor"; Edward Sallie dedicated the pavers donated "In Memory of the Loved"; and Alicia Pye dedicated the pavers donated "Supporting the Garden". After Carol's siblings were introduced to our guests Rev. Dr. Louis McDowell, Pastor of Mt. Pilgrim Missionary Baptist Church in Passaic, gave the Dedication Prayer. Following the ceremony guests were served light hors d'ouvours and drinks.